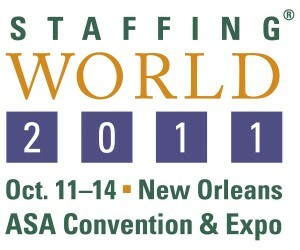 Staffing World 2011, the world’s preeminent staffing industry event, arrives in New Orleans this month, October 11- 14, 2011. Hosted by the American Staffing Association, the conference brings together the largest gathering of staffing leaders, innovators and suppliers for four days of industry insights and learning. Attendees will have access to networking opportunities, professional development workshops, and a variety of presentations from highly regarded business leaders. In addition, event-goers will have a chance to witness the latest technologies, products and services from exhibitors representing over 40 categories. Among the numerous scheduled offerings, recruiters will be interested in a special networking breakfast and search and placement sector session on Friday, Oct. 14, 7:30–8:45 a.m. During the session, entitled: “Recapture Lost Fees,” attendees will review best practices for negotiating fees, how to get up-front money for search assignments, how to use replacement policies as a marketing tool, as well as many other topics. Learn the most successful strategy and step-by-step tactics for business development, recruiting, and closing sales. Strategize ways to maximize your recruiting process, outperform the competition, and grow your business network. Gain critical hiring strategies for sourcing and attracting the best talent. Discover how to align direct hire production goals to on-boarding, development, and coaching programs to effectively build a dynamic direct hire team. Participants will learn about technology tools that can lessen administrative burdens, increase a recruiter’s reach, and keep recruiters in tune with the latest strategies. Discover how to avoid hiring mistakes with an innovative profiling system, and take away key traits for hiring revenue-producers in your firm. The Staffing World 2011 staffing industry event will be held October 11-14 at the Ernest N. Morial Convention Center, New Orleans, LA.